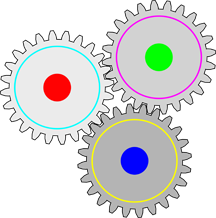 Three gears in a configuration that's inherently locked up. Any combination of an odd number of planar gears configured in a loop is inherently locked. Email exchanges about complex dynamic topics aren't inherently locked up, but the probability of dysfunction increases as the time scale of changes in the substance of the topic decreases to and then drops below the end-to-end latency maximized over all participants. Image by J_Alves. When we work together to resolve issues or make decisions, or even to gather information, we engage in a series of exchanges. We ask and respond to questions, report status, propose explanations, provide opinions, and much more. We do this in email, by teleconference, in face-to-face meetings, and at times, by text message. One exchange can even span several of these media. But because so many of us are moving targets, email has become a primary means of carrying out these exchanges. It's so dominant that we use it even when we don't need to, and that's where the trouble begins. Exchanging email is a kind of conversing, but it differs from telephone and face-to-face conversation in important ways. Email doesn't represent emotive content faithfully; the writing skills of authors of email are variable; and authors tend to dash off messages without careful thought. I could go on. But four properties of email exchanges expose participants to elevated risk of making wrong decisions. These four receive much less attention than they deserve. Here in Part I are two of these properties. In the context of email exchanges, latency is usually defined as the time between origination and receipt of a contribution to the conversation. We can call this form of latency transmission latency. It can differ for different participants. Perhaps more significantly, and more usefully, latency could be defined as the time between the author's conceiving a contribution and the recipient's reading it. We can call this kind of latency end-to-end latency. What happens during the end-to-end latency period includes all transmission delay, but also delays caused by workplace interruptions, offsets in the sleep-wake cycle, urgent demands for the attention of authors and recipients, and other factors. have severe effects.instances, end-to-end latency can be infinite. This happens when spam filtering blocks or quarantines messages; when authors intend to contribute but fail to do so for some reason; when recipient errors or high incoming email volume cause recipients to overlook messages; or when recipients misinterpret messages and on that faulty basis elect not to respond. In synchronous meetings — face-to-face, live video, or telephone — when a participant's contribution is invalid in some respects, other participants can offer corrections almost immediately or relatively quickly. The original contributor might then either dispute or accept the correction, equally immediately. Invalid contributions have relatively short lifetimes. By contrast, in email exchanges, invalid contributions can have longer — sometimes much longer — effective lifetimes, because of the longer end-to-end latency of email messages. And during the time in which the invalid content is extant, it can spin off additional content that itself can be invalid. When contributions correcting the original message finally appear, the original poster might not see them immediately, which further delays final resolution of the issue. Would you like to see your comments posted here? rbrenMariKWtxYvxWvWxnner@ChacyojhmYTCSvaZgVCJoCanyon.comSend me your comments by email, or by Web form. I offer email and telephone coaching at both corporate and individual rates. Contact Rick for details at rbrendzxxtCwOYUYUWIckner@ChacyTIKvzinnuCPskcKoCanyon.com or (650) 787-6475, or toll-free in the continental US at (866) 378-5470.